The Supreme Court will hear arguments this week in a case that could gut the historic law. To understand where this is going, it’s crucial to know how we got here. History will repeat itself in the chambers of the Supreme Court this week. The very state where the fight for voting rights reached its critical peak nearly 50 years ago is once again at the center of the dispute over democracy in America. But oddly, the political and legal odds may now be tilting away from civil rights and back toward an era in which the federal government had limited power to protect voters of color in the South from the machinations of local leaders. The Supreme Court will hear arguments on Wednesday from an Alabama county that is challenging the constitutionality of Section 5 of the Voting Rights Act. That section protects voters of color in sixteen states (some fully covered, some partially), many of which have long brutal histories of denying black Americans their voting rights. It does this by making covered jurisdictions “preclear” election law changes with the federal government before implementation. Shelby County claims Section 5 is unconstitutional because it treats covered jurisdictions, which hold 25 percent of the nation’s population, differently than the rest of the nation. The Supreme Court must decide whether to continue holding Section 5 jurisdictions, most of which are in the Deep South, under the watch of federal officials, or to strike the section so that all states are treated the same, whether legacies of oppressive voter policies exist or not. If the court strikes Section 5—and its conservative justices have already signaled they may do so—individuals could still file legal complaints, but no longer would the federal government be empowered to proactively watchdog the polls. The Voting Rights Act would be held together by Section 2, which mostly allows lawsuits after an offending law has already been passed, and too often after damage is already done. Pursuing such reactionary litigation routinely would stretch the Justice Department and civil rights groups beyond capacity. Remember all the court challenges before the November 2012 election? Imagine that on crack. A brief history on how Section 5 became Section 5 is necessary to illustrate its imperative. The debate that will happen in the Supreme Court this week is not new. Rather, it’s best understood as an extension of a legal tug of war between the federal government and Southern states that began just six months after the Voting Rights Act became law. In the summer of 1965, Congress was mulling legislation that would prevent the kind of bloody atrocities the world had witnessed on TV—sheriffs billyclubbing, firehosing and shooting black people who were trying to vote in the Southern states. The Voting Rights Act was drafted at President Lyndon B. Johnson’s request and in response to the demands of civil rights activists not only throughout the South, but increasingly across the nation. Within that legislation Section 5 was created so that states that had employed ever-shifting tricks like literacy tests and poll taxes to suppress black votes would not only have to cease these practices, but also would have to run any future ideas past the US Justice Department or a federal court in Washington, DC. Many Southern judges and courts could not be trusted. To ensure they had the right culprits, Congress created a formula that would “trigger” which states would be covered. That formula was based on voter participation—if less than 50 percent of African-Americans in a political jurisdiction were registered by 1964, or if less than 50 percent had voted in that year’s presidential elections, then the area deserved coverage. The trigger formula and Section 5’s preclearance provision were huge sticking points from the beginning and almost stopped the Voting Rights Act from becoming law. Southern states, most of which failed the trigger test, didn’t like being singled out, and even President Johnson thought it was too punishing. The “which have the effect” phrase is important because it established that racist intentions weren’t required to prove a law was discriminatory. If a law merely had the effect of denying black people their votes, then it couldn’t fly. Section 5 would be tried consistently over the next few decades—and would also face challenges in Congress. When the Voting Rights Act was up for renewal in 1970, Attorney General John Mitchell tried to weaken it by stripping out Section 5. Instead, it was expanded, and the Section 5 coverage formula was updated to include states with poor voter participation before the 1968 elections. Also, the franchise was expanded by dropping the voting age to 18. Five years later, Section 5 was on the chopping block again when Congress began reauthorizing the law. By that point, civil rights activists were growing uneasy about its long-term security, especially as some Democrats wanted to try to expand its coverage again. Representative Barbara Jordan of Texas, the first black woman elected to Congress from the South since Reconstruction, led a strong congressional push for its reauthorization, desiring a broadening of the law so that states that discriminated against non-English-speaking citizens would be covered. This was a courageous stance, especially when there was still a conservative contingency that wanted Section 5 dismantled. Congress approved it for seven more years and with Jordan’s wider coverage formula, which now protected Latino and Native American voters. Also, the trigger formula was updated so that poor voter participation before 1972 would add jurisdictions to the Section 5 mix. This led to Texas’ blanket coverage—and would make the state Section 5’s top nemesis in the decades to come. Texas is arguably where the legal history of voting rights begins, with the 1944 case Smith v. Allwright, argued by then–NAACP attorney Thurgood Marshall who called it his most important case. Forty years later, though, voting rights almost was turned back to the pre–Smith v. Allwright era. In 1982, President Ronald Reagan determined Section 5 a threat to his political philosophies on states rights and deregulation. A young lawyer in the Reagan Justice Department was crusading against the Voting Rights Act following the lead of the administration’s civil rights attorney William Bradford Reynolds. That young lawyer was John Roberts, who today is the chief justice of the Supreme Court and will preside over this week’s hearing on Section 5. The law was eventually renewed, helped along by a robust defense effort led by the Leadership Conference on Civil Rights, with Section 5 preserved for the next twenty-five years. That brought it up for reconsideration in 2006, when civil rights advocates produced a 15,000-page report showing that voting rights violations—both the subtle, and the obvious—continued, and specifically in the Southern states covered by Section 5. It was renewed for another quarter century. But the trigger formula was not updated, nor had it been in the 1982 renewal. And that formula is at the core of the Supreme Court debate this week. To be clear, conservatives, and the Southern states, are hoping to do what they’ve been trying to do since the beginning: kill Section 5. In this case, Shelby County v. Holder, they are banking on Congress’ failure to update the coverage formula to abet them, arguing that the current voting climate necessitates a new or different remedy than what Section 5 offers. They point out that states not covered by Section 5—like Pennsylvania and Wisconsin—have passed questionable voting laws without scrutiny. For this same reason, many voting rights advocates would like to see Section 5 expanded yet again, which would require a modification of the coverage formula. The issue presented in Shelby County v. Holder is not whether the Justices think Alabama is worse than Ohio, or even whether Congress might permissibly conclude that it is. Instead, Shelby County presents a different question: whether Congress has the power to extend a remedial regime that everyone agrees it lawfully adopted based on its conclusion that the regime continues to do critical work in the places where it operates. That conclusion should not be suspect, much less invalid, simply because problems have since developed in other jurisdictions that Congress might also appropriately regulate. In other words let it do what it do, especially since it’s been doing it so effectively. Katz conducted an extensive study of Voting Rights Act violations under Section 2, the provision that provides for after-the-fact voting rights complaints and covers the entire nation. She found that the jurisdictions covered by Section 5 were more than five-and-a-half times as likely to be sued for violations than non-covered jurisdictions. Of the total Section 2 cases that ended favorably for people of color—whether through court ruling or settlement—28.5 of those occurred in covered jurisdictions for every one in a non-covered. That means voting rights violations are in fact occurring much more frequently in jurisdictions covered by Section 5. It’s targeting the right areas. It is constitutionally permissible for Congress to focus attention on areas where discrimination in voting is persistent and adaptive; a law does not become unconstitutional simply because it does not solve every instance of discrimination—particularly when that law’s demonstrated track record shows that it does solve many such instances, and in the places with the most stubbornly persistent voting discrimination. Attorney Debo Adegbile, who will help defend the Voting Rights Act in Shelby, told reporters last week that at root Section 5 is about the “minority inclusion principle”—making sure that the voices of people of color aren’t muted or erased in the election process. He said that the state of Alabama is perhaps unfit to challenge Section 5 due to its own “unbroken chain of repetitive discrimination” and violations, stretching from the passage of the law to the present. Shelby County’s city of Calera was just blocked in 2008 for its redistricting plan, which eliminated the only majority-black district and erased the city’s only black representation on city council. Calera took away that choice so the county it rests in, Shelby, has “unclean hands” that don’t deserve a favorable remedy from the Supreme Court. 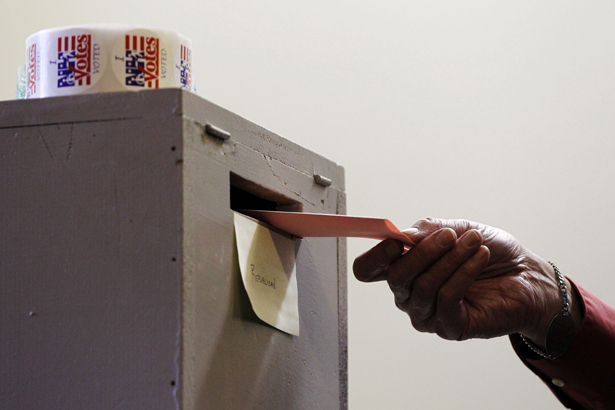 Congress’s 2006 Voting Rights Act authorization was no one-night affair. They debated and investigated the issue for nine months before passing it with a bipartisan consensus that would be unthinkable today. They even tweaked Section 5 to make sure its impact would be more equitably distributed by modifying provisions for bailing covered jurisdictions out of oversight, and adding a provision that allows for non-covered jurisdictions to be added in. The question, said Ifill, is whether Congress had the authority to do the 2006 reauthorization and did it “go through a rational process” to arrive at its conclusion. On a more optimistic note, legistlation in Virgina would allow more to vote by reducing ID requirements to a passport or driver's license, Voting Rights Watch reports.